Yard sale. There’s a million jokes and a certain amount of disdain associated with that phrase. Pardon me, Mr. Fancypants, but that isn’t junk, that’s bits of my life spread out all over the front yard. Bits of my life that I have to get rid of because of two households colliding so that I can take care of my aging parents. That child’s wooden high chair that you don’t think is worth 35 bucks, that was handmade by my great grandfather in the 1800’s. That red and white glassware? I love it, but I don’t NEED it, and I no longer have room for much that I don’t need. That necklace that doesn’t look like anything special, that was given to me by a kiddo I worked with, because they desperately wanted to give me something and that’s all they had to give. Then there’s the books. The giant pile of books that is about half of my precious book collection. Carefully sorted and culled out, because I don’t have a huge two bedroom apartment to scatter them out in. Yes, I know books don’t sell well at a yard sale. Yes, I’ve heard of Half Priced Books, I’ll take the rest there. I just wanted to give some of them a chance at a happy home first. And who are you anyway, Mr. Fancypants? You act so disdainful of my yard sale, but you’re right here, at the crack of dawn on a cold and windy day, looking for something to buy. That’s not junk strewn across my front lawn, it’s my life. It’s my memories. If you don’t want to buy any of it, fine by me, but keep your disrespectful comments to yourself. This entry was posted in Change, writing and tagged adjusting to change, getting rid of memories, Taking care of parents, Yard sales. Bookmark the permalink. Lovely family pic at the end. Kinda brought it all home – the happier times. The beautiful things in the background. How sad it is to have to let things go. That’s an old pic. 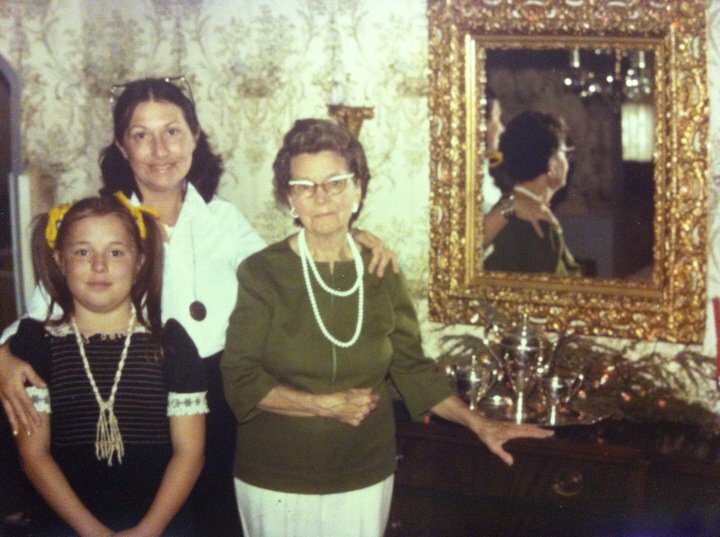 Little me, my mom, and my grandmother. Seemed appropriate though. That giant mirror in the background is something we don’t have room for now. Strong family likeness running down and your mum then looks a lot like you now.